Offers Nobu-unique modern Japanese dishes fused with Peruvian influences. Personally I enjoyed my salmon but my filapino companions were not happy with either the taste or the slowness of our food service or settling the bill. It appeared management was more concerned with decor than tasty food or service efficiency. 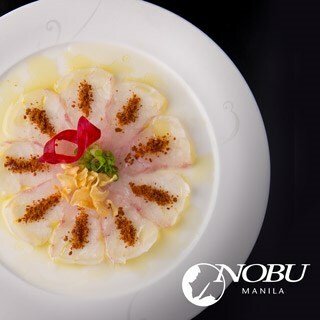 Our previous experience with Nobu Sunday Buffet was the time period where it newly opened. It featured a large fish Lapu-Lapu in one food station while there was a Japanese chef walking about. In comparison to then, we were partly disappointed though overall the experience was certainly above average. Our fault for not asking about Lapu-Lapu prior to booking. The services was incredible & the food was amazing. Great atmosphere. Highly recommended. Exceeded my expectations for the quality of food and flavours. Outdoor dining is exceptional, loved NOBU. Poor service and food quality is consistent - not worthy of the Nobu name. Service on the night was not great, despite the restaurant being quite. Also ran out of two of the wine so that I wanted. Great food and great service! Will come back soon. Staff was very accomodating. Delicious food. Very pleased with thr customer service. A++ definitely recommend it. It was a wonderful experience at one of the best restaurants in the world. Look forward to dining with you again. Service and Quality of the food was world class. Would definitely recommend to try the Sunday Brunch Buffet. Price is pretty high in all honesty. But the service is impeccable, the food tastes great although I would've preferred bigger servings, and the atmosphere and ambiance was very serene and relaxing. Overall a nice dining experience for my parent's anniversary. Prices are pretty steep though in my opinion. Great selections of sashimis, awesome atmosphere and superb service. .
Servers Rolan and Jan were amazing!!!! They were very knowledgeable and attentive. They were a complete asset to the Nobu staff! Food was delicious does not disappoint, happy to have celebrated our anniversary here!